In this article, Richmond Decorating Center – with three convenient showrooms in Richmond, Glen Allen, and Newport News, Virginia (VA) – is here to tell you about the ways motorized window treatments can transform your home. We proudly carry the full line of Hunter Douglas window treatments. There are tons of options out there for home automation, so naturally your window treatments should be included. With PowerView® Motorization from Hunter Douglas, you can adjust your window treatments without ever leaving the couch. At Richmond Decorating Center, we offer a wide selection of motorized window treatments, so you can find the style that works for your home. Stop by one of our showrooms today to see how our motorized blinds and shades can transform your life. PowerView® Motorization is a revolutionary operating system that has won several industry awards since its creation, and it’s easy to see why. With PowerView®, you can easily get rid of harsh glares or let more light into your home to help keep it more comfortable. In addition, PowerView® can help make your home more energy-efficient. This operating system also makes your window treatments cordless, so they are safer for children and pets. PowerView® can be operating in a variety of different ways, so you can choose the one that works for your. The Pebble® remote control is a stylish, ergonomically-designed device that can be either left loose or mounted on the wall like a switch. It comes in 10 beautiful colors and is easy to use, allowing you to adjust up to 6 window treatments at once. Don’t want to add another remote to your life? No problem. 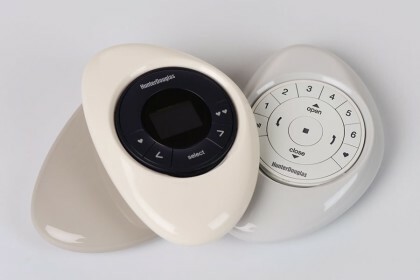 PowerView® Motorization can also be operated using the app on your smartphone or tablet. Not only can you use the PowerView® app to adjust your window treatments at will, you can also schedule them to adjust automatically throughout the day, so you’ll never have to give them a second thought. You can have your window coverings operate based on time of day or outside temperature, and you can even sync them up to local sunset and sunrise times. For even more convenience, you can even incorporate PowerView® Motorization with a whole-home automation system, like Amazon Echo or Google Home. With this option, you can control your window treatments with just your voice, meaning you won’t even have to lift a finger to get your blinds or shades where you want them. Along with how easy it is to operate, PowerView® Motorization is also available on many of our most popular window treatment styles, so you won’t have to sacrifice style for convenience. We have options for blinds, shades, and even shutters. No matter what you’re looking for, our friendly professionals can help you find it. If you’re interested in adding motorized window treatments to your home, contact the experts at Richmond Decorating Center. We have three showrooms in Richmond, Glen Allen, and Newport News, Virginia. From these locations, we proudly serve The West End, the Southside of Richmond, VA, and The Fan. In addition to our Hunter Douglas window treatments, we also offer a wide selection of beautiful flooring as well as cabinets and countertops, so you can create exactly the look you want in your home.